You guys, I do not advise going into a dark basement in an empty house for a piece of furniture. That’s what I did for this dresser, and it was worth it, but I won’t say that I wasn’t a little creeped out while I was there! Thankfully the woman who sold it to me was super nice and not at all creepy. 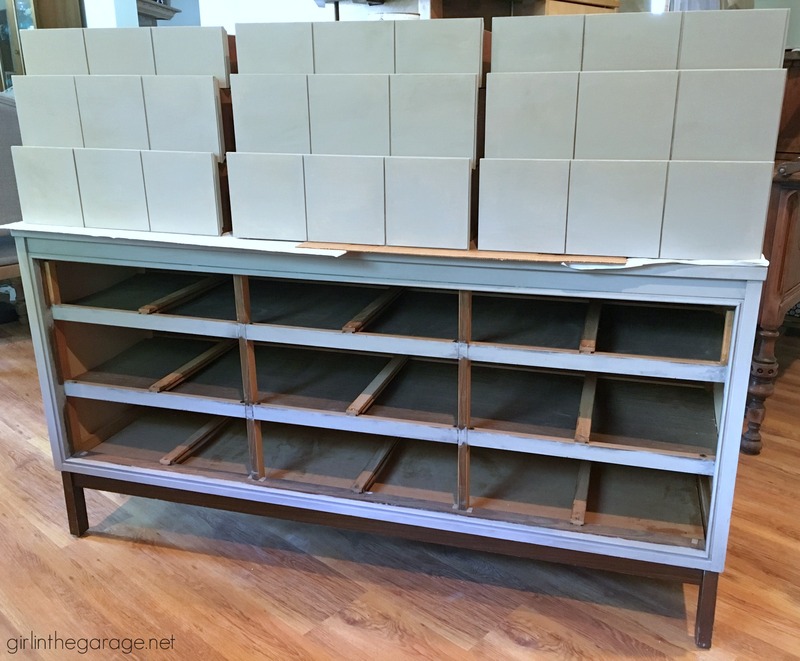 From the moment I first saw it, I knew exactly what I was going to do with this midcentury plain-front dresser makeover. 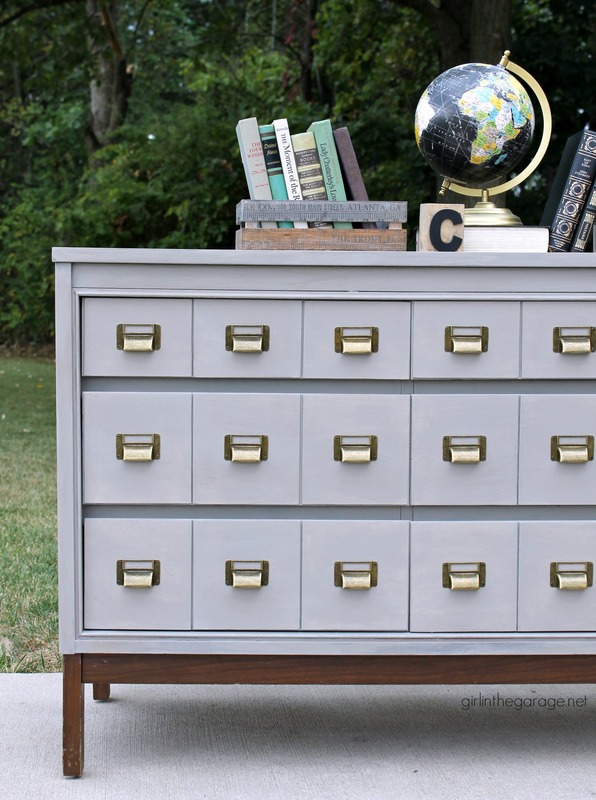 Pieces like this are absolutely perfect to turn into a DIY card catalog – and it ended up being the star of the show at my last market in September. 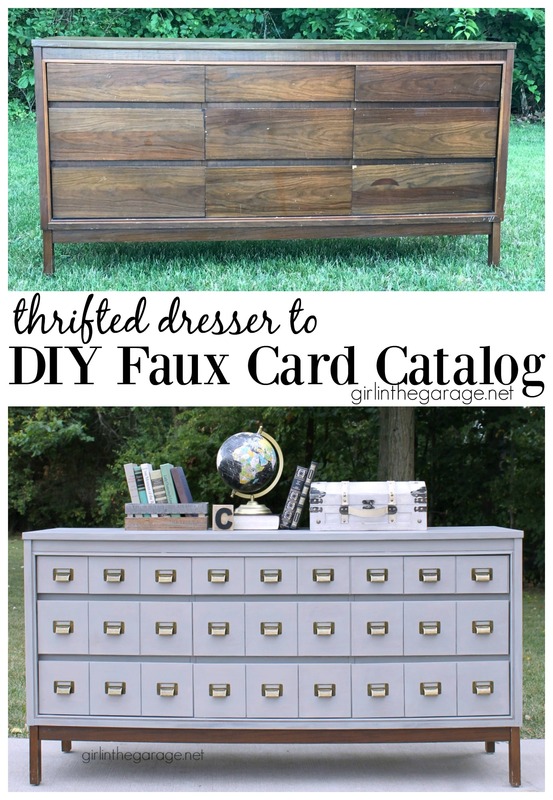 Here’s how to make your own faux card catalog dresser. 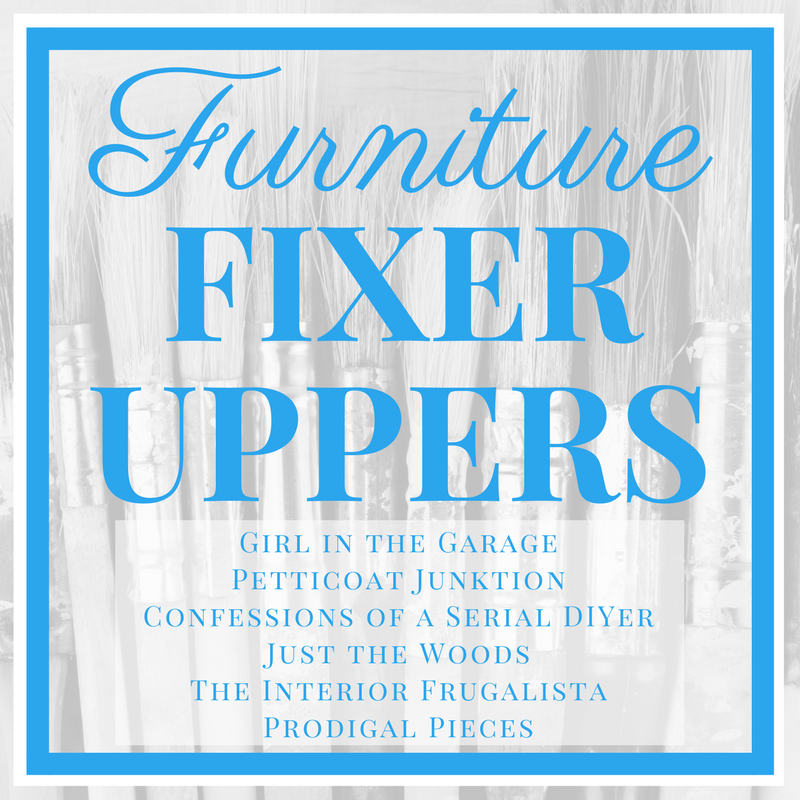 **Friends, today is Furniture Fixer Uppers day! 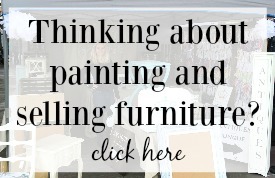 See three more creative makeovers at the bottom of this post from my blogging buddies. Also, this post contains affiliate links so that you can easily find some of the products I use and recommend. Thank you for your support. After making any necessary repairs to the dresser (mine didn’t need any), measure the drawers. The top row was not as deep as the other two rows, so my panels needed to be one size for the top row and a different size for the other two. 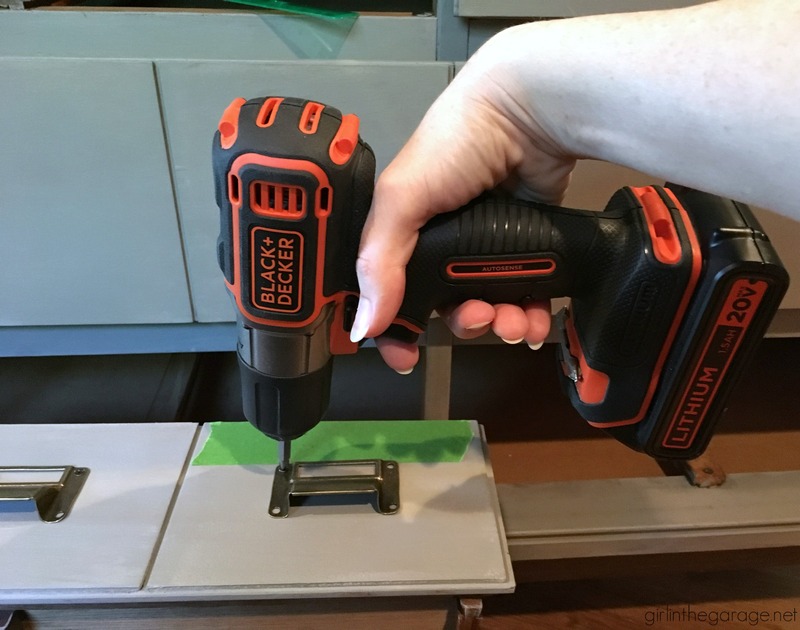 At first I bought some craft wood at Hobby Lobby, then we discovered that our local hardware store had the same kind of thin wood and it was less expensive (not near the big lumber, but near the dowel rods). 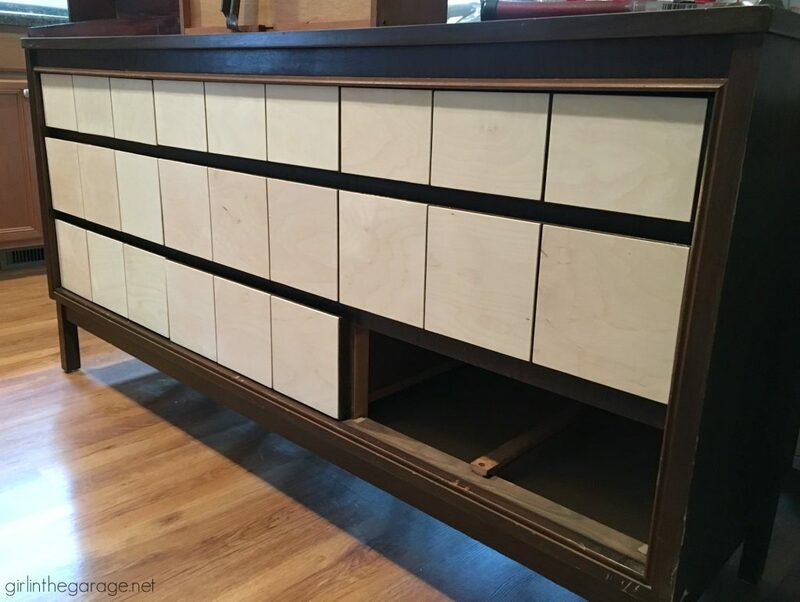 Guy in the Garage cut three panels for each drawer (27 total for this project), and made them the same height as the drawer. I glued one on each side so they were just a hair away from the drawer edges, and then one evenly spaced in the middle. 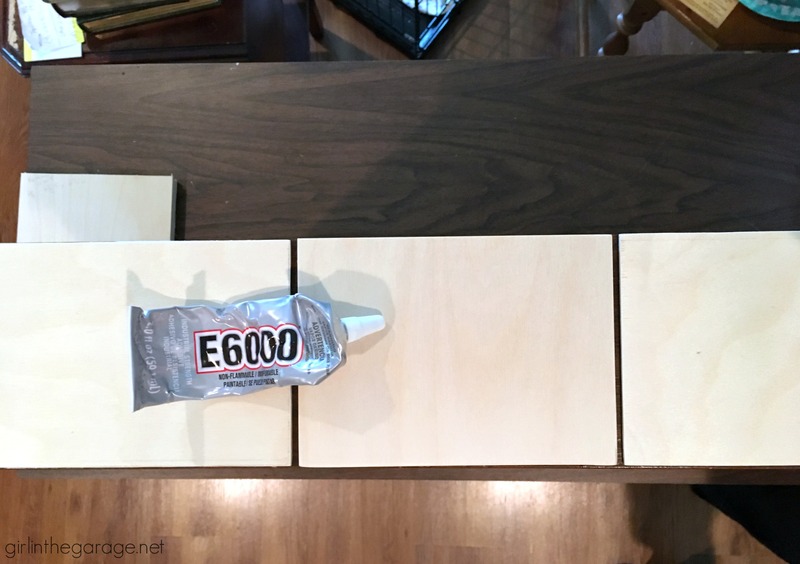 Altogether it took almost two tubes of E6000 super glue (the strongest and my favorite kind – find it Here) and several clamps and weights. 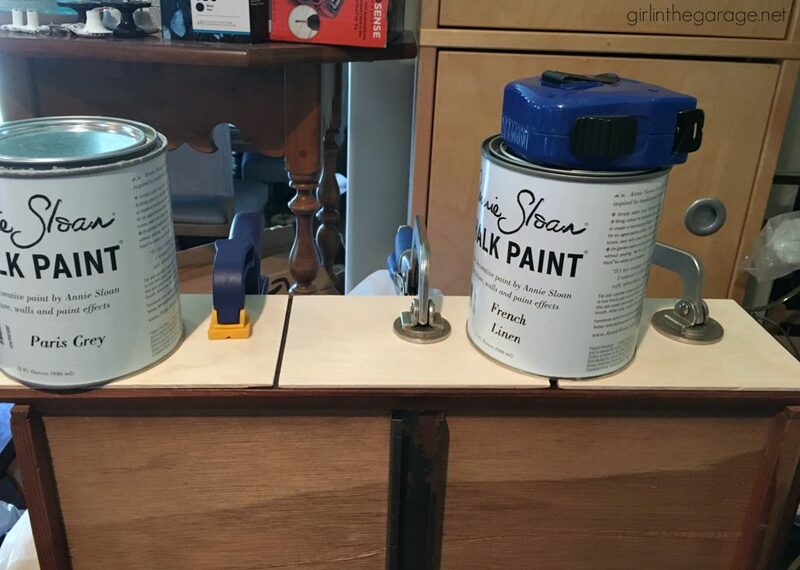 I let each drawer sit for about 24 hours while the glue dried, so this step took a few days. Finally on the last drawer….. yeay! 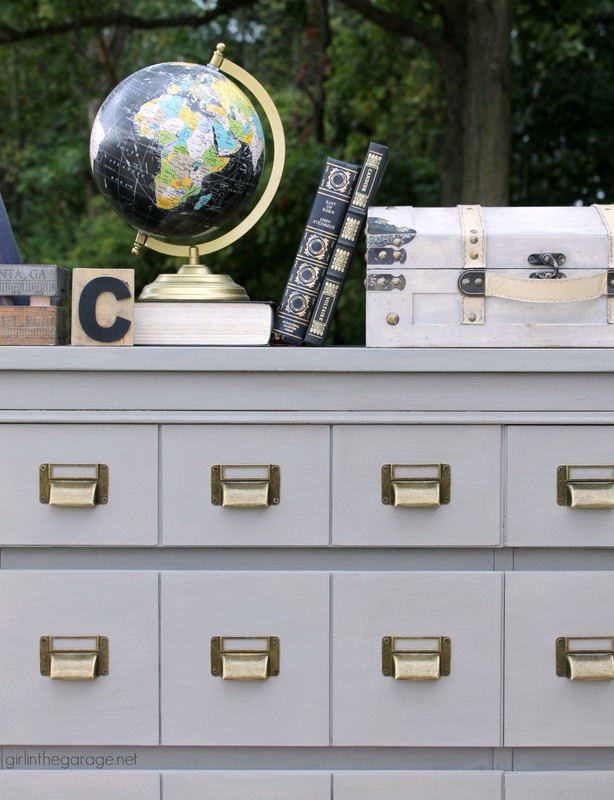 First I used Annie Sloan Chalk Paint in French Linen, then I dry brushed a tiny bit of Paris Grey and some Coco over the top. It ended up with a very cool almost metal industrial look which was perfect for this piece. I used Fusion Mineral Tough Coat as a topcoat (find it Here). 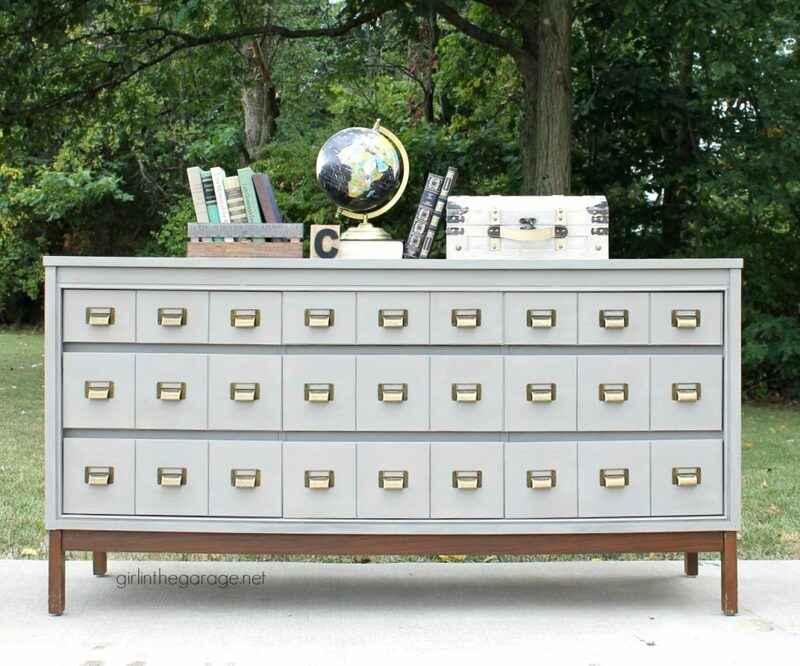 After 108 screws were in place, this card catalog dresser makeover was finally finished! 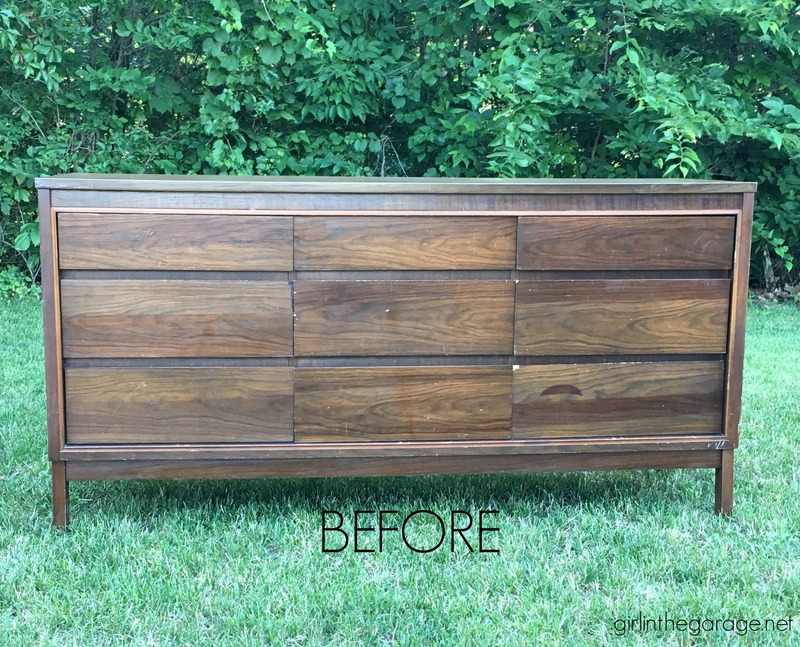 I kept debating whether or not to paint the bottom of the dresser where the legs are. It was a little scratched, but the existing brown “wood” color looked good as-is. In the end, I left it alone. This DIY card catalog dresser makeover has become one of my favorite projects! 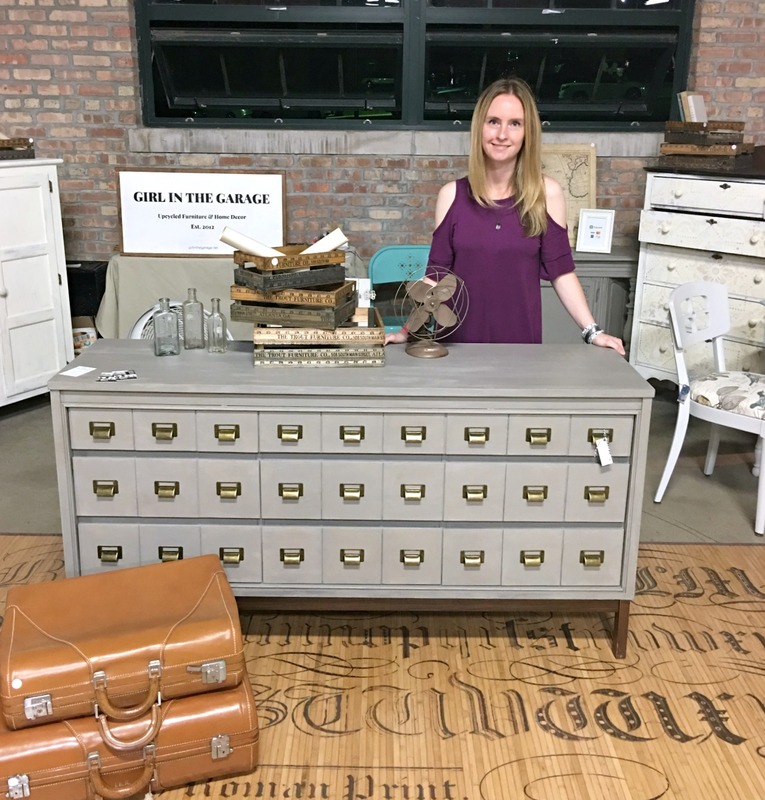 It got a lot of attention at the Hunt and Gather market and sold the first night. I was sad to see it go and had to take one last photo with it. 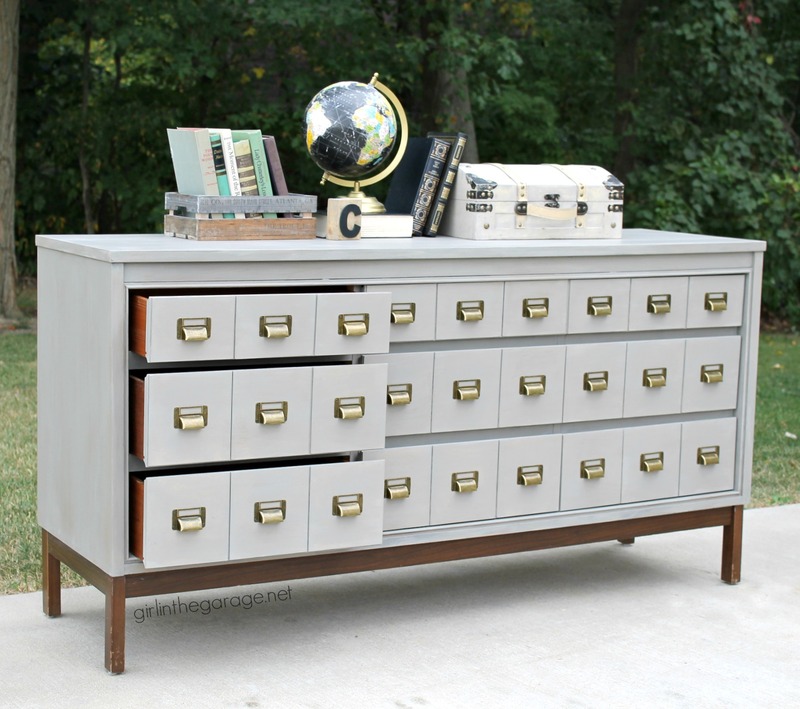 I hope this piece inspires you to think outside the box with a plain piece of furniture. If you like this makeover, please Pin it or share it with a friend! 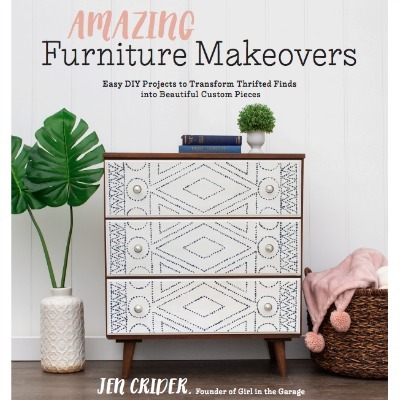 Next – I have three blogging friends also sharing makeovers for Furniture Fixer Uppers day (sadly, Confessions of a Serial DIYer and The Interior Frugalista couldn’t join us this month). 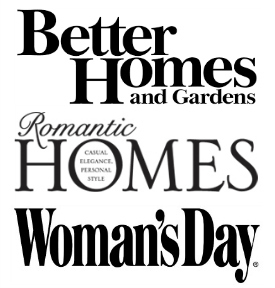 Below are the Before photos – click the links underneath to see the After and learn how they transformed it. Looks so good, Jen! No wonder it sold so quick. this came out amazing! I love the end result! Terrific Transformation! Thank you for your detailed instructions. I really love the look of this. Good job. Gorgeous piece, love what you did. 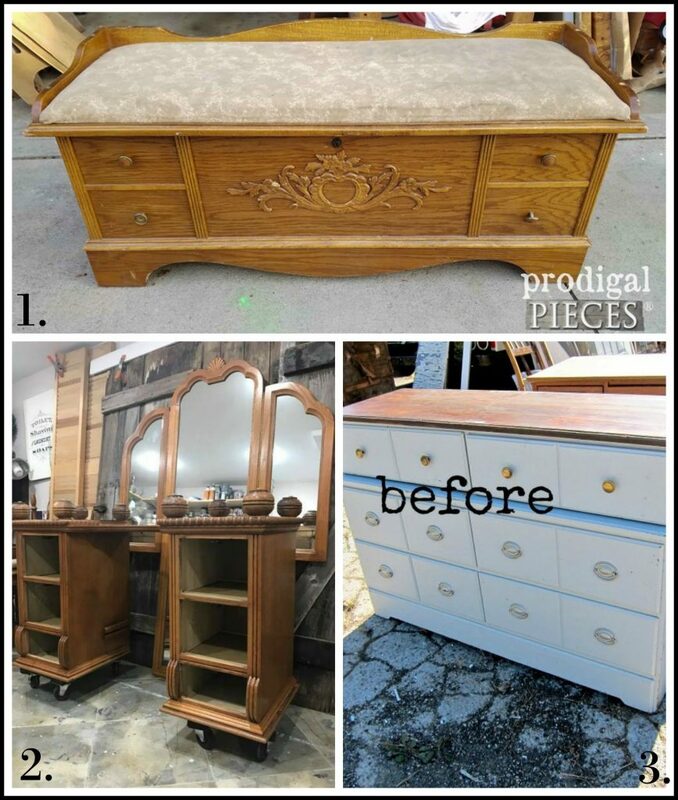 No surprise this sold quickly, Jen, what a fabulous transformation! Wow!! That turned out amazing!!! Love the color! 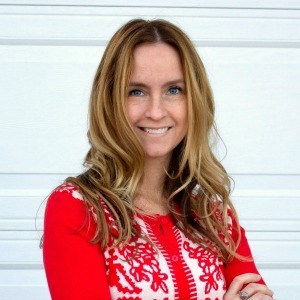 Blown away by this amazing transformation, Jen. Pinning this! Great job Jen, it turned out fantastic. I am impressed! You make it look so simple. I have some stuff I want to rehabilitate. I am going to give it a try. 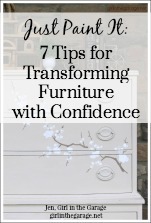 Also signed up for your free guide. Thank you!